Garret Garrels shares a BlueBill with a fan on the "Rocky" steps in Philadelphia. We as a people have evolved over time, while our money– the way we talk to each other about value– has remained firmly stuck in the past. Our economic model has been producing products while dumping our waste into the river, making the poor suckers downstream deal with it. But the reality that there is no 'downstream'. Those 'suckers' have laws with teeth and they know where we live. Yet our money is still living out the outmoded myth of the industrial revolution where one could get rich by destroying nature. We have already changed much of our myth: We now know that we have to have a clean world in order to survive much longer. Now it is time to drag our monetary system along into the 21st century. Remember when the airwaves were public property, when an education didn't leave you with a life-crippling debt, when you had a secure retirement? Now the 1% say they can't afford these luxuries since we owe them so much debt. How is it that while technology and innovation improve by leaps and bounds from social cooperation effort, average income falls? Something is terribly wrong. The ongoing financial crises points out the inherent falsity of depending on an economy that is not rooted in anything of real value. The reason Wall Street can make obscene profits while raiding the pensions of citizens is that money chases "profit" without regard to any damage that may cause the rest of us. The world economy will continue to crash in ever bigger crises until we wean ourselves from an inherently destructive mythology that detaches money from reality. Our future will depend on our ability to root our money in true value and to adapt to the true meaning of health: values in action. When money is created, the government (we the people!) essentially gives it to banks who take ownership of it and loan it out at interest, (to people like us) along with–surprise– a new added debt. When that interest is repaid, where does it come from? It comes from either the earth itself or from the community. Yes, interest encourages borrowers to be more efficient, but once efficiency is reached interest doesn't stop. It grows forever, compounding until it's either paid off (by being passed on to some other sucker) or you go bankrupt; or you die and your kid goes bankrupt! Erin Bell listens for the ring of the future in the face of a BlueBill. Like a hungry monster it keeps demanding more. Unlike everything else in nature, it neither dies nor is transformed, but interest lives on, growing ever larger. The world's collective debt can never be paid because there's not enough material in the world to pay it. Our current system is desperately trying to forestall the coming crash by harvesting all earth's resources and ensnaring all her peoples (through debt.) This is felt by every person, though we tend to accept it as objective reality because it has been the norm for ages. We are headed for more global financial crashes. But the severity depends on where we place our faith. If we honor the traditional monetary system above all else we will sacrifice nature and people to that god. But if we honor people and nature first, the crisis will destroy the monster instead of us. The future is going to look very, very different. Every one of us will live differently. The question is: HOW? BlueBills is a very simple, subtle, grass-roots means to help make the transformation to a new, healthy economic culture by assisting people to change the mythology about how humans relate to nature. It only takes one BlueBill for a person to be touched by it forever. It is no longer viable for us to destroy the “principle” of nature in order to pay the “interest” of human institutions. We must learn to live on the “interest” that nature and the community naturally produce. The good news is that this is exactly what our hearts long for: a life not of “working for the man” but of meaningful interchange with nature and other people. The time is now! For a very detailed but readable discourse about these issues, please refer to Sacred Economics, by Charles Eisenstein, a great book available for free online! Toward a happy, positive future. A) Token -Even a monkey can understand the basic layer of trade: a token is worth a grape. Money is born. B) Authenticity -A clever monkey can even get that a wooden nickel is not a real token and will reject it. A genuine bill must be issued by a common political authority. C) Root Value -Here is where a BlueBill,–based on the real value of a clean world–distinguishes itself from a green one, which is based on nothing! D) Responsibility -A green bill can be gotten honestly or through deceit, it's all the same and there's no way to check. A BlueBill has a clean history and is always traded upon the express value of a clean world. Thus it becomes increasingly difficult for a dishonest person to trade with BlueBills because they must convince every person they trade with that they believe in the value of a clean world (Whether or not it's true makes little difference!) 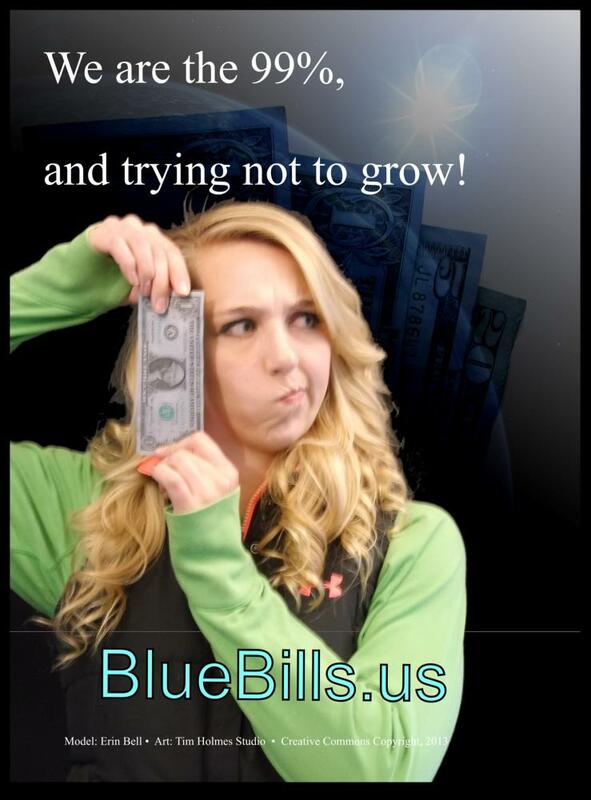 BlueBills can be used for any purchase so long as the spender roots their value in a clean world. It doesn't even matter what the money is spent on, as long as the spender supports whatever a "clean world" means to them, which is the single common element. E) Community - The effect of a BlueBill economy is a gradual separation of dishonest players from the honest market. Trading upon the expressed value of a clean world will drive all economic activity (using BlueBills) toward "good" values. It's not that exploitation with BlueBills becomes impossible, just increasingly difficult. Our monetary system has not caught up with our beliefs. You know this is true. We all know that more money can be made exploiting the environment than doing good works. Even if one doesn't care a bit about the garbage that exploitation leaves behind, they have to recognize that the means that once were of supreme value (like raw materials, slavery, acquisition through war) have been replaced by more complex means of even higher value (like medicines, international trade and creative ideas). And in fact making money the old way is becoming trickier as the suckers downstream of industrial processes become more sophisticated in claiming their rights. Those who profit from exploitation will have to change course. What is required is not a massive social overhaul, but a simple change of attitude. We now know that destroying nature and social bonds are not good for the future and that preserving the environment and social ties IS good for the future. Now all we need is an economy that recognizes that fact. That's where BlueBills can transform our monetary system, not by changing the fundamental structures of the economy but by simply changing the people's declaration of faith to reflect what we already believe is the source of real value! The more we reject an exploitive economy the more expensive and less desirable that approach will become. And the more we affirm the values of a clean and co-operative world, the more of that kind of world we will see around us. If you look on the internet, you'll see it's already appearing everywhere!